Here we go again – another USPS price increase is coming up in January. The Postal Service filed its 2018 postage rate proposals in October with the Postal Regulatory Commission (PRC). The PRC has approved the price increases, and they will take effect on January 21, 2018. Our clients, direct marketers who mail thousands and millions of packages each year, are interested in the Market Dominate Product increases which include First-Class Mail and USPS Marketing Mail (formerly known as Standard). The average increase for First-Class and Marketing Mail is about 1.9%. Prices for individual sortation and entry points can vary from no change up to a 2.47% increase. David Henkel, J&Q’s President and Leader Extraordinaire, was interviewed by Frank Romano, Curmudgeon Emeritus (his title, not ours) of WhatTheyThink.com in September at the Print17 Show in Chicago. View their conversation on the evolution of digital printing in the video that was recently published by What They Think? Frank and David discuss Johnson & Quin’s entry into variable data printing in the late 1970’s and early 1980’s, starting with a Xerox cutsheet black-only laser printer. Over the years J&Q has invested in many monochrome laser printers and more recently color sheet-fed printers. Three years ago, J&Q purchased their first high-speed color inkjet printing system, the Screen TruePress 520ZZ which is the most popular roll-fed inkjet press based on the number of units sold throughout the world. Johnson & Quin began in 1876 when Nels Johnson founded the N.M. Johnson Company – Blank Book Manufacturers and Book Binders. The company’s first advertisement called Merchants, Bankers and Business Men to the attention of our superior facilities for the manufacture of blank books. Today we call all Marketers to the attention of our superior digital technologies for the production of response-generating direct mail! One of the reasons J&Q has been successful over the years, is our ability to adapt to and utilize new print technologies PLUS our strong quality control procedures. Today most of the direct mail we produce is printed and personalized on some type of digital printer – most on high-speed color inkjet printing systems. Phil Riebel, president of Two Sides North America, recently wrote an article appearing in PostPress Magazine titled “Paper and Print: Not Only Sustainable. . .But Also Essential”. ¹ It provides an excellent overview of how most people still use and prefer paper for many activities, and why organizations should understand the implications of switching from paper to digital communications. 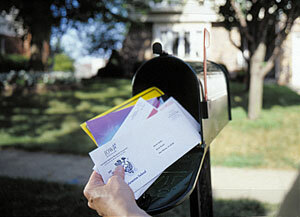 Sooner or later virtually all direct mail will be produced utilizing full color inkjet printing technology. At Johnson & Quin that technology is available today! Johnson & Quin has a long history of innovation, and today we are on the leading edge with color inkjet. We are guiding our clients on how best to use this production technology to lower costs and provide more customized messaging to increase response. Our latest video provides an overview of J&Q and reviews the benefits of producing direct mail with color inkjet presses. 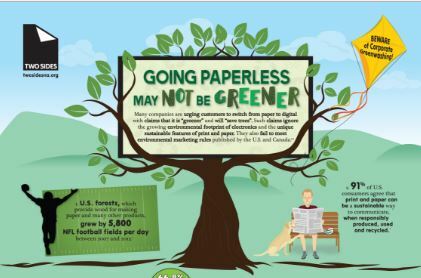 When I think of Earth Day I think of trees which leads me to paper (since paper is quite essential to direct mail) and to recycling which ties back into caring for our planet. . . and Earth Day! The Forest Stewardship Council (FSC) is an independent organization that protects forests for future generations. It promotes environmentally sound and economically prosperous management of the world’s forests while meeting the current need for forest products. It was created in 1992 by a group of businesses, environmentalists and community leaders to stop deforestation and improve forest practices worldwide. Johnson & Quin, whose direct mail production relies on paper, has FSC Chain of Custody Certification. We are one link in the chain of suppliers who use FSC certified paper – from forest owners and paper mills to printers and marketers who use paper to promote their companies’ products and services. Johnson & Quin is the first US Postal Service® customer to receive authorization for co-branded sales collateral. The USPS and J&Q are together promoting the use of direct mail in omni-channel campaigns, and specifically for customer acquisition. For businesses today attrition is a given, making acquisition marketing critical. And consumers are shopping using a wide variety of channels and on multiple devices resulting in a cluttered mediascape. Companies must engage customers in a variety of ways, and the more targeted the messages, the better. As you may know, postal rates are changing on January 22, 2017. 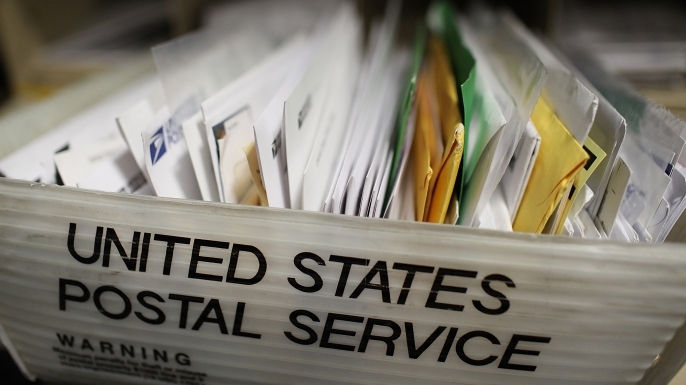 For commercial mailers, some rates go up, some remain the same, and some actually decrease. When looking at all the changes, prices increase by about 1%.